A second consecutive home loss to Barcelona on Saturday would likely end Madrid's title hopes in the Spanish league and deal a tough blow to a demanding fan base tired of seeing their team struggle against its rival recently. Another disappointing result would also send the team into a crisis entering the final stretch of the season, with coach Santiago Solari likely paying the highest price. 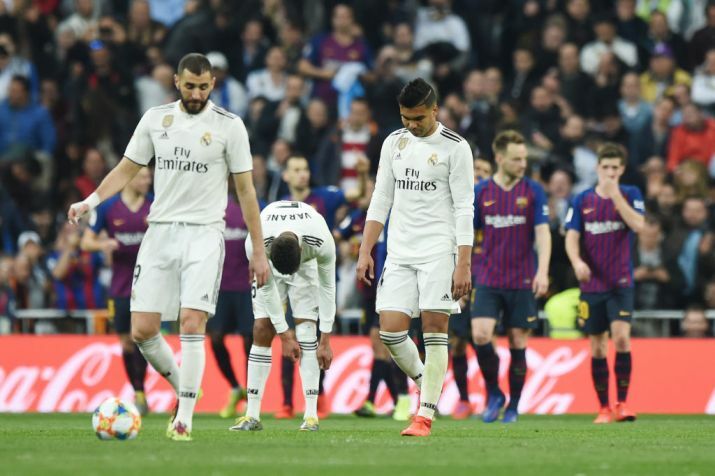 Wednesday's 3-0 defeat to Barcelona at Santigao Bernabeu Stadium knocked Madrid out of the semifinals of the Copa del Rey. A repeat will drop it 12 points behind its league-leading rival with 12 games left. Solari said his team had fully recovered from their Copa exit. "We are back on our feet," he said Friday. "The schedule, and destiny, wanted us to face the same opponent, to play the great 'clasico' of Spanish soccer once again. We are going into the match with the same desire and the same spirit as in the previous match, trying to improve what we need to improve and repeat the things that we did well." Madrid played a great first half on Wednesday but failed to capitalize on its scoring chances, and Barcelona scored three second-half goals to advance to its sixth straight Copa final 4-1 on aggregate. Madrid is winless in the last five games against its rival in all competitions. It was stunned 5-1 at Camp Nou Stadium in this season's first league 'clasico' and lost 3-0 at home in the league last season. Barcelona won 10 of the last 17 matches the teams played in the Spanish capital, dating back to a 6-2 rout under coach Pep Guardiola in 2009. "The next game is always the most important one. It's what the players are focused on," Solari said. "This is a sport that is played with heart, head and legs, and we have to put everything into this next game." Solari knows another humiliating result could mean the end of the line for him. The former Madrid player arrived in October as an interim coach to replace Julen Lopetegui, who was fired after the teams' first meeting. Rumors about Madrid considering rehiring Jose Mourinho have increased significantly since the Portuguese coach was let go by Manchester United. Barcelona coach Ernesto Valverde, in a much more comfortable situation than Solari, said he "hoped for the best" for the rival coach, but would definitely try to beat him again on Saturday. "We are not concerned about what another loss would mean to our rival," Valverde said. "We are only thinking about what it would mean for us. We are fighting for the league title. It's a crucial match." Valverde wasn't expecting things to run as smoothly as they did in the Copa match, though. "It's very unlikely to get the same result when you play against the same team right away," Valverde said. "But we need the victory again, it would important for us in the league." Barcelona has a seven-point lead over second-place Atletico Madrid, which visits mid-table Real Sociedad on Sunday.